How does IMTBIKE calculate rental days? IMTBIKE has morning and evening pickup and drop off times. The morning times are at 9:30 am and the evening times at 6:30 pm. *As a courtesy IMTBIKE will let you pick up the bike on the previous night of your first rental day and drop off the bike on the following morning after your last rental day at no extra charge. What are the requirements to rent a motorcycle with IMTBIKE? You must be over 25 years old and have a minimum of 2 years of experience with a motorcycle license. 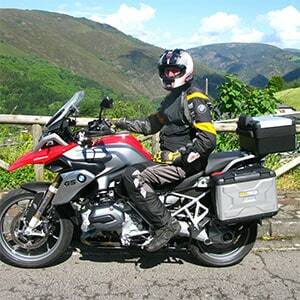 You must have at least 5000 kilometers (3000 miles) of riding experience in the last 3 years. To pick up the bike you must present your passport and driver’s license. You should also have an International Driver´s license which is required by European Law. What is the difference between regular insurance and the VIP insurance? Both insurance policies are full coverage. The regular insurance has a damage deductible of 2000 Euros, and the VIP insurance has a damage deductible of 350 Euros. The regular insurance is included in the rental cost and the VIP insurance costs 20Euros/day extra. The VIP insurance can only be taken out on rentals 4 days or longer. Can I store my luggage at your rental location until after my trip? Absolutely! All IMTBIKE rental stations have free luggage storage. Any bags that you do not want to take on your motorcycle adventure can be left with us until your return. Can I pick up the motorcycle in one city and drop it off in a different city? Yes, one way rentals are possible for a 200 Euro surcharge within Spain and 300 Euro charge in Portugal. We have 7 different locations to choose from: Barcelona, Madrid, Bilbao, Santiago de Compostela, Valencia, Malaga and Lisbon, Portugal. Can I rent a helmet and riding gear? IMTBIKE does rent quality motorcycle gear including: helmets, motorcycle jackets and gloves. To find out more about our equipment rental and prices please contact us. Can I ride the motorcycle outside of Spain? Our motorcycles can be ridden in other European countries. It is a good idea to list in the comment section of the booking form the countries that you intend to visit during your rental. It is strictly forbidden to take our motorcycles to Morocco or outside Europe. Outside of Europe there is no insurance cover and the customer would be responsible for all damages that might occur as well as for the loss of revenue to IMTBike for each day that the motorcycle would be unavailable to the company. Can I ride the motorcycle offroad or on a racetrack? Track riding and non-asphalt roads are strictly prohibited on all IMTBIKE motorcycles. There is no insurance coverage on the motorcycles for off-road or racetrack riding and you will be responsible for the full amount of the damages and loss of income to IMTBIKE. Can IMTBIKE drop-off/pickup the motorcycle at the airport for me? The motorcycles must be picked up and dropped off at our rental centers. This is where we do all the paperwork and sign the contracts. What is the included daily mileage? There are unlimited kilometers included on rentals of 7 days or longer. On rentals from 1 to 6 days there are 300 kilometers per day included in the rental price. Any extra kilometers over the 300 km. limit will be charged at a rate of 0.30 euros per kilometer. Can I change my rental dates? Yes, you can change your rental dates for a fee under the following conditions: Rental dates can only be changed once. The rental dates change must be made at least one working day before the start of the rental and the new rental dates must be given when the change is made. The new dates must be within 12 months of the original rental start date. THERE IS A SURCHAGE FOR THIS SERVICE. THE SURCHAGE IS EQUAL TO 20% OF THE RENTAL PRICE OR 100 EUROS, WHICHEVER IS GREATER. If you cancel your rental more than 30 days prior to your rental you will be refunded 50% of your deposit. If you cancel from 30-15 days before your rental you will be refunded 50% of the total rental cost. If you cancel 15 days or less there will be no refund. Is there a minimum number of days to rent a bike? The shortest rental is a one-day rental during working days, Monday through Friday. For week-end rentals there is a 2-day rental minimum (Saturday and Sunday) with pick-up on Friday night and drop-off on Monday morning (provided those days are not holidays). I am only interested in rented one model but I have to put down a second choice on the booking form, how can I make sure I get my first motorcycle choice? In the “comments” section write that you are only interested in renting your first choice and we will take that into account when we process your booking form. I want to give a motorcycle rental as a gift to a friend. Is it possible? How do I go about it? Yes, you can surprise a friend with a motorcycle rental gift from IMTBIKE. Please contact us and we can help you organize the best surprise birthday gift your friend could ever ask for! My friend and I have rented two different models for the same trip. Is it ok to switch bikes to try the different models during our trip? Absolutely. If you and your friend want to switch bikes to test ride two different BMWs that is fine with us.